I was living in Hawaii with my husband and baby on the Marine Corps base in a duplex that — we were told — had been built shortly after World War II. It was an old house, with painted wooden walls and linoleum floors and, unbeknownst to us, spirits. About two months after moving in, my husband was sent away for a month of training. I hated being on my own, but knew that this was the life I had accepted as a military wife. I decided to sleep in our living room on our futon couch so that I could fall asleep to the only TV we had. My habit since childhood was to turn the volume off but keep the TV on so that if I woke up in the night, it wouldn’t be pitch black. One evening I was dozing on the couch when I heard the front door handle jiggle. In my sleepy mind, I thought my husband was at the door. I heard my name called out in a heavy whisper, so close I could feel the breath against my ear. I opened my eyes smiling, ready to go to the door and let my husband in, but then remembered that he wasn’t on the island and he wouldn’t be home for another three weeks. I checked the door, and no one was there. The windows were all closed, too. I knew that I’d heard my name and the door handle move, but I tried to tell myself it must have been a dream. I had to stuff down my fear that it wasn’t my imagination, but my denial wouldn’t last for long. The next afternoon I saw my neighbor Sharon, a nurse who lived in the adjoining house with her husband Jay, and told her about the strange noises I’d heard. What she told me gave me goose bumps. We both stared at each other with wide, frightened eyes. Neither of us knew what to make of it. Thankfully, nothing else happened while my husband was gone and eventually, I forgot about the strange occurrence. Shortly after my husband returned, that changed. The activity increased and was hard to ignore. In our living room we had a stereo with a three-CD disk changer that we hardly used. One night, around two in the morning, the stereo turned on full blast and was playing one of the CDs in the compartment. The noise was so loud it startled all of us awake. I could see that my husband was as terrified as I was to hear this noise blasting through our walls. He bravely ran to the living room and turned the stereo off. We picked up our son from his crib and brought him in to bed, and after an hour or so of silence, finally fell back asleep. We tried to tell ourselves it was a fluke. Maybe the stereo had some pre-programmed setting we didn’t know about. The next day, when we checked, we saw that there was no way to program music to play in the middle of the night, or at any hour. A few days later, while taking a short nap on the couch with my son, I heard the sound of feet shuffling through the house and cabinets opening and closing. The sound, with my eyes closed, seemed like someone just walking around doing normal stuff. The fact that no one else was home made it terrifying, and it started happening all the time. It seemed that whenever I closed my eyes, the noises would start. In early October I gave birth to our second son and five days after our son was born, my husband had to deploy. It was difficult to say goodbye and also scary. I couldn’t imagine being alone with our children with whatever was going on in our house. After he drove away, I walked inside our house and asked, out loud, that whatever was inside to please leave us alone while my husband was gone. “I can’t handle it alone,” I said. I was desperate and remember my eyes filling up with tears. The spirits must have been listening because the entire seven months of my husband’s deployment, not a single incident occurred. Three days after my husband returned home, however, the activity started back up again, and with more intensity than ever before. The same stereo that had played in the middle of the night started turning on again, more regularly, scaring us every time. When I called home to talk to my dad about it, he suggested we pull the plug. I remember doing so one night before bed and wishing I hadn’t just a few hours later. In the middle of the night our oldest child, then a toddler, would usually wake up and climb into our bed. My husband would pick him up, walk him back to his room and stay with him until he fell asleep. The night I unplugged the stereo, our son came in shortly after midnight and my husband walked him back to his room. I could hear that my husband didn’t close our bedroom door when he left so I called out to him to shut it, since I didn’t like opening my eyes to a pitch-dark hallway. With my eyes closed, I heard the bedroom door shut. Then, I heard soft footsteps and, finally, I heard my name whispered directly into my ear. It was a heavy whisper that could be felt against my skin. I turned around, thinking it was my husband, and saw no one. I immediately sat up in bed and began screaming. My husband and I stayed awake the rest of the night, keeping vigil. We were both scared, but probably me more than anything since my husband hadn’t heard the whisper. I decided the next morning to plug the stereo back in and turn the volume all the way down. The next night, the music began playing again, and, even though I’d turned down the volume, it was full blast. Each night when the stereo turned on, the music was different, so I decided to pay attention to the lyrics. I figured maybe whatever or whoever was doing this wanted to communicate with us. I didn’t know what song that was, but I remember knowing, instantly that this song was a message from my mother, who had been gone since 1995. Paying attention to the words filled me with comfort instead of scaring me. Maybe the spirit activity had been my mom all along? She described hearing the sound of footsteps all throughout the night, and seeing the shoes we kept by the front door in different positions whenever she would open her eyes. Sometimes, she said, cabinets would slam. Anya’s story confirmed what we’d already known — there was a spirit (or spirits) in our house. I no longer believed it was just my mom. 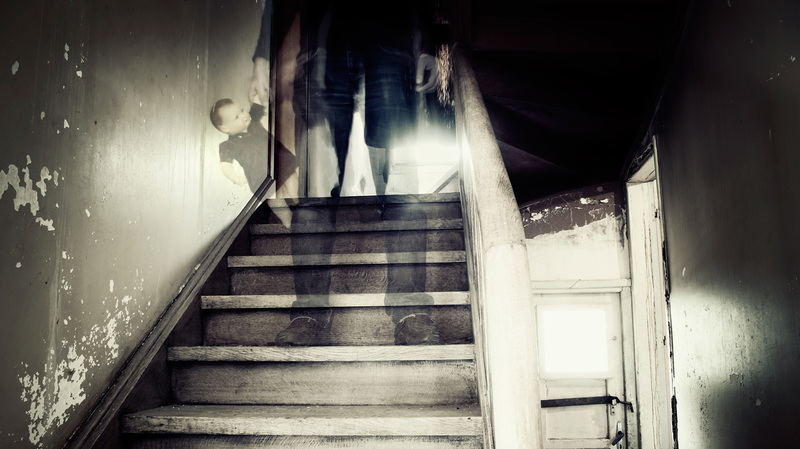 I couldn’t explain why, but I felt that there were other spirits in our house and although none of them were necessarily menacing, I didn’t feel they liked us living there. For three years we lived in that house and eventually moved away in 2001. In 2008, a year after we were re-stationed in Hawaii, the haunted house we’d first lived in was torn down along with all the homes in the neighborhood to make way for the construction of newer properties. Strangely, the exact spot where our house used to sit was never rebuilt upon. The area was turned into a small park overlooking the ocean. We never knew for certain who or what was in our house, but we hoped that whoever it was, they’d found peace and moved on. It’s been eighteen years since that experience and nothing like that has ever happened to us again. When people tell me about haunted homes, I no longer think it’s a paranoid delusion, because I know, from personal experience, it does happen and it can be very scary — but also strangely beautiful and comforting.